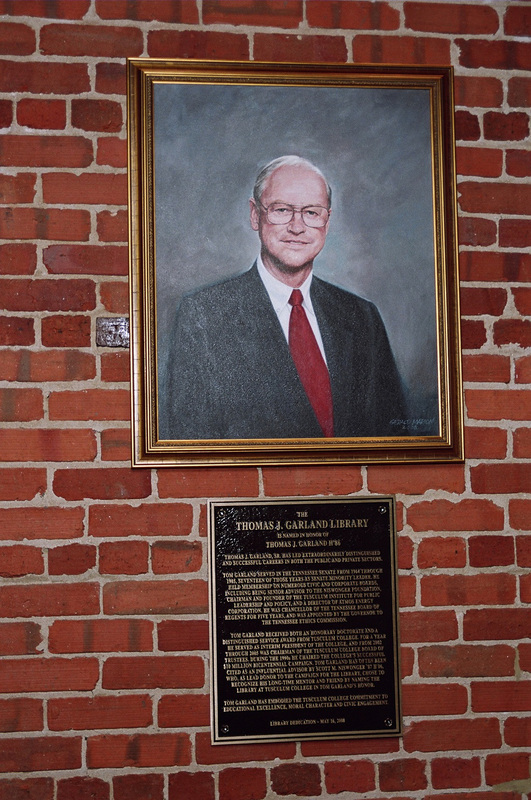 The Thomas J. Garland Library honors a lifelong East Tennessean with a long and illustrious career in public service, higher education, and private enterprise. His public service includes serving as a Tennessee State Senator from 1964 to 1985, 15 of those years as Senate Minority Leader. He served as Chancellor of the Tennessee State Board of Regents for five years, overseeing the State University and Community College System. He also served as the first Chairman of the Tennessee Ethics Commission, and served as a board member and senior advisor to the Niswonger Foundation. On local and state levels, Garland has been a leader of dozens of legislative and governmental study groups, and has served on numerous nonprofit boards. His service to higher education includes providing leadership to Tusculum University in immeasurable ways. He served two separate terms as chairman of the Board of Trustees. He served as interim president of the University in 1999-2000. He founded the Tusculum Institute for Public Leadership and Policy. He also was one of the co-chairmen of the Campaign for the Library fund-raising effort for the expansion and renovation of the facility. His experience in private enterprise includes organizing and operating his own businesses, serving as an executive with two national banks, and founding a state-chartered bank. He also was a member of the board of directors of a Fortune 500® corporation. Garland was born in Kingsport, educated in Kingsport and Oak Ridge school systems, served in the United States Air Force, and graduated from East Tennessee State University with a B.A. degree. In 1973, he received the ETSU Outstanding Alumus Award. He holds an honorary degree from Tusculum University and was awarded the University’s Distinguished Service Award in 2002.